The white 1800s farmhouse in the photo is near its end; it suffered from a bad address located at the ugly intersection between capitalism, real estate and zoning. Because of that quirk—that Bob Dylanesque “simple twist of fate”—the wide sloping lawns and the big maple trees are gone, torn-up, cut-down and bulldozed-over. Gone, too, are the home’s two vegetable gardens, the site where my grandfather’s prized tomatoes and cherished horseradish grew, as well as my grandmother’s more prosaic but dependable carrots, beans, lettuces, peppers, and squashes, along with the marigolds, herbs and other flowers that defined her companion-planting approach [a traditional way of keeping the bad bugs out and the good ones in]. Also gone is the one mulberry tree that offered its perplexing mid-summer fruit; what exactly was the point of a mulberry—what was one supposed to do with a handful of mulberries to make them taste good? Kind of like the crab apple tree or the black walnut tree; why bother? You can’t see where the big wide front porch came off of the living room; that’s been taken down, and the photo above makes it look like the home’s two outbuildings were never even there: no walk-in white-and-green tool shed with the tools organized, cared for and stored, and no oversized multi-function garage/barn/hayloft because they’ve been razed as well. The long-capped stone well that used to be on the right-side of the back-door’s entry path has similarly disappeared as the once-green grassy grounds have, for all intents and purposes, been ground-up to make way for development. 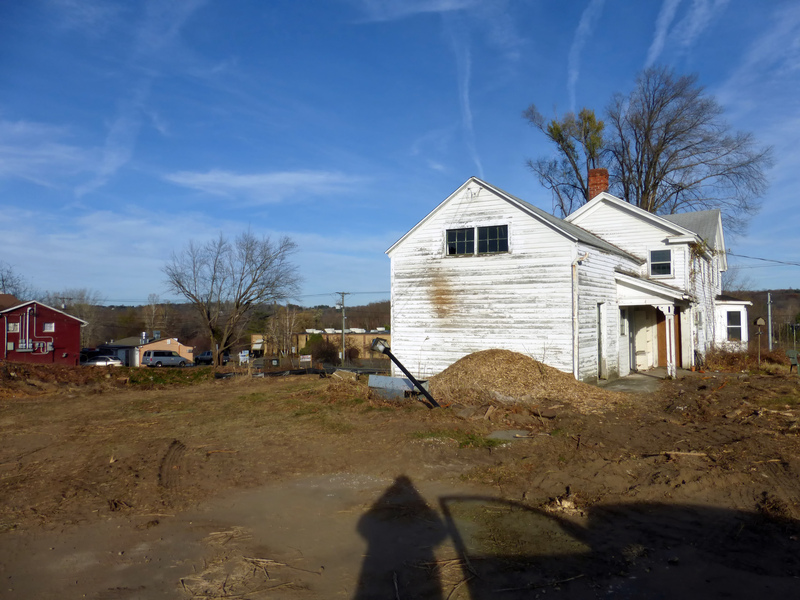 What’s left is a peeling-white clapboarded ghost house surrounded by an indeterminate moat of loamy topsoil; both have been denied their primary function, both no longer can sustain the life that was previously there. Even the paved sidewalks are gone, those simple concrete pads that were once patinated by the near-infinite hops, skips and jumps of several generations of the Humphrey family’s life played-out over a many-decades’ period. The Professor’s mother grew up in that house, but you might also say that her parents did, too: a young married couple starting out in the crazy world of the 1930s. They couldn’t afford a house on their own so The Professor’s great-grandmother Charlotte Augustus Brown bought it for them [it wasn’t a gift or trust-fund largesse; they paid her back every month]. But it got them through the door, and once there, they had the house expanded and modernized, moving the front door, adding a bay window, a summer kitchen and a bedroom and storage area. That place was the only home that my Mom and her seven siblings ever knew. And since her four brothers and three sisters all had kids, it became a place to visit for all of the grandchildren. including The Professor. The 20-or-so cousins used to arrive from elsewhere in Connecticut or Long Island or Maine to gather for the year’s most fair-weather holidays: Memorial Day, the Fourth of July and Labor Day. There would always be kids running around, playing badminton, horseshoes, games of tag, even throwing Jarts® [the weighted lawn darts that were tossed in the air and aimed at a plastic ring; what could possibly go wrong there?]. And there would always be a cook-out, sometimes with Grandpa’s special BBQ sauce on burgers, and other times with fresh-grilled platters of chicken. There would always be too many salads, and too few pies. Nearby, to the side, an old oil barrel was 2/3 filled with ice chunks and water; dozens of cans of freezing soda and beer sank to the bottom and had to be fished for amidst the ice water. Frozen fingers grabbed at Cokes®, 7-Ups® and root beers and then had to be manually perforated with a can-opener on a string [in the pre-pull-tab days of carbonated beverages]. There is much to learn from contemplating such summer-time rituals as the extended family cook-out; that there is much to be gained from examining the vernacular building patterns of old Connecticut farmhouses and their outbuildings, that there is something worthwhile to be found in looking into their blue-collar, middle-class exposition of American domesticity; and that there is even a life lesson or two to be learned from the material culture of my Grandmother Humphrey [always in her simple short-sleeved white shirt with her gray hair piled up in a bun on the top of her head somehow radiating her signature smile of serenity], and from my Grandfather Humphrey [always in his faded suspenders, work trousers pulled-up high, tan billed cap always on his head, looking stern and significant whether he was grilling, fishing or working on cars, as he always did]. The Professor now sees the house—surrounded by excavations and piled dirt—as but a forlorn and haunted carcass, an empty caricature of the home it once was. The Humphrey place has been turned into a transactable commodity, a commercially-zoned plot whose aim is return-on-investment but is, at the same time, a death knell for the idea of home. It was a simple, ordinary and honest [not-fancy-in-the-least] farmhouse that had the audacity in its later years to occupy a prime bluff overlooking a busy road. When The Professor’s mother grew up there, their water came from a spring half a mile away; the woods extended around the house for acres and acres; there were glades carpeted by lady slippers and stands of peeling white birches. All of those are long-gone in the name of development. The Humphrey place is undoubtedly gone, too, but it was my late grandmother who, before she died, put it into the best, neo-Thoreauian, straight-from-a-Connecticut-Yankee perspective: “The place had already been ruined by too many improvements” she said. The Professor hopes that this message of willful simplicity and anti-ostentation will encourage others, his students most of all, to consider the full and often darker meaning of progress—and that’s why they call me The Professor.